Think clotheslines are a relic of a bygone era, a time when our grandmothers slaved over their dainties with stiff birch-wood pins? Think again. Hanging clothes is hot, due in no small part to the rising costs of, well, everything. Between soaring utility bills, concerns for the environment and a growing interest in traditional home arts, forgoing the dryer is the newest (oldest) way to tackle laundry. But how does one do it properly? For those of us with more experience rebooting hard drives than hanging socks, our laundry know-how is as fuzzy as a 1940s photograph. Save money on your wardrobe by following these double-duty style tips. "The biggest complaint people have with line-dried clothes is that they're stiff and wrinkled," Gehring says. She says you can avoid this problem by giving your clothes a good shake, then hanging them with a little space between each item for maximum air circulation. Gehring warns against using fabric softener, saying that 1/2 to 1 cup of white vinegar added to clothes in the rinse cycle will make them lighter and fluffier. "You might notice a faint vinegar smell on your clothes," Gehring says, "but that can be easily masked by adding a couple drops of essential oil to the wash."
The life of your clothes can be extended by hang drying, but there are still ways to stretch your favourite shirt if you're not paying attention. Gehring advises against hanging stretchy knits because they could lose their shape. Instead, she suggests laying them on an elevated drying screen. "In the absence of a laundry screen, I've even used a window screen and a couple of bricks," Gehring says. For less finicky knits, she recommends hanging shirts upside down with pins on the bottom side seams to reduce clip marks. Pants should be draped at the knees and clipped on the sides to keep their shape. To avoid fading and keep clothes soft, Gehring hangs her wash in the shade, as direct sun can bleach fabrics and leave clothes stiff. Emily McClements, a South Bend, Ind., mother who blogs about simple living on her site LiveRenewed.com, prefers direct sun-drying for her army's worth of laundry. "My kids are hard on their clothes," McClements says. "The sun helps bleach out the stains, but doesn't set them the way a dryer would." To avoid fading colorful knits, she hangs those items inside out. For small items, such as children's clothes, McClements suggests doubling up clothes and overlapping pins. With more laundry than space on the line, she says a drying rack can be a great addition for undergarments and socks. Because drying racks are portable, they can be moved into the sun or the shade, and offer a great outdoor drying solution for urbanites with small yards or apartment balconies. "Every little bit you're not drying in a dryer helps," McClements says. Apartment dwellers can also take advantage of indoor drying space by hanging clothes on shower curtain rods, drawer knobs and radiators. Gehring, who shares her time between Windham, Vt. and a studio in Manhattan, says she has hung laundry on just about every available surface. "Of course it's best to have a laundry line, but I've used curtain rods inside and tree branches outside," Gehring says. "Just don't hang your clothes on wooden furniture," she warns, "or you'll stain it." 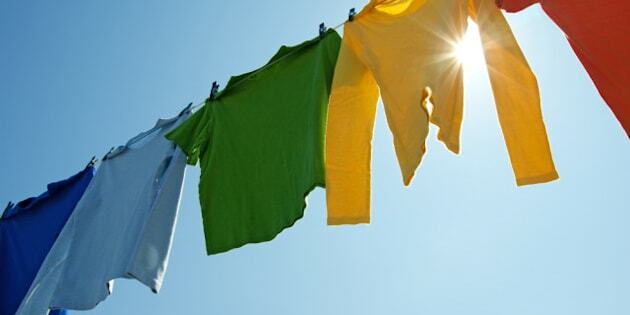 Despite the benefits of hang-drying in the summer sun, there are a couple of caveats to airing your not-so-dirty laundry. Neighbors may find your clotheslines unsightly, and some communities have even gone so far as to ban the practice. Then there's the matter of allergies. Clothes hung outside can pick up pollen — a problem for anyone with seasonal allergies. Dr. Kraig Jacobson, an allergist with Oregon Allergy Associates in Eugene, Ore., says allergy sufferers should be mindful of the season when hanging clothes outdoors. "Whether or not it's safe to hang your laundry outside depends on the time of year, what you're sensitive to and what part of the country you live in," Jacobson explains. "If you live in Oregon and are sensitive to grass pollen, you wouldn't want to hang your clothes outside in May or June." Before hanging your wash outside, Jacobsen suggests, check the American Academy of Asthma, Allergy and Immunology's website at aaaai.org to check pollen counts for your region. It's also important to check the weather forecast before you air-dry outside. Nothing puts a damper on your outdoor laundry aspirations like a rainstorm. But if a little unexpected rain shower arrives? "Don't worry," Gehring says. "Just leave your clothes out and they'll dry again."